it is with delight that i write my first studiola post from a tiny couch under a loft bed in my studio-attached-to-a-garage in san diego (no wind sounds in the backyard palm fronds, but the crickets are doing their thing). i am no stranger to wordpress (currently up to 1,267 posts over at my daily blog. yikes. ), but it almost feels like a whole new thing, putting a post up under a new header at a different site. and for that, i have the stupendous and charismatic alison barker to thank. (thank you for your amazing introrduction! and thank you for having me here.) hard to believe it was way back in july or august near a cornfield in the afternoon heat that alison asked if i’d be interested in curating a month at the studiola. and now, it is coming to fruition as i scramble to finish my thesis (i’m in the MFA program in writing at UC San Diego). it was difficult to see now from where i stood then. but here we are. and i am grateful to have made it. i’m not sure i was thinking so much about the ways community and solitude play out in relation to one’s creative practice back in those corn fields in july. and i’m not sure what changed, but these days i feel like i’m thinking about these intersections all the time. while alison said that the curation process at studiola is an open one filled with endless possibility, i’m envisioning looking pretty closely into the things listed in the studiola tagline (community, solitude in the artist’s life). in this post, i’d like to do some thinking and talking about social practice. writing as social practice. or, how to create social practice around writing. what the hell even IS social practice is a question i asked myself recently when i started to think that my interest in collaborative writing might be more correctly stated as an interest in writing as social practice. i know that still doesn’t answer the question. maybe i need to rewind. i have been reading and writing a lot about water. for at least a year now. i have a dreamvision of traveling everywhere to ask people everywhere to tell me their stories about water. (whether it’s being in it or drinking it or having gone without it or the places water is found. anything. anything at all about water). i have been dreamvisioning this for years. cut to spring break 2013. this march, i was lucky enough to hike into the backcountry of the sonoran desert with 10 other MFA students. we were guided by the brilliant and badass amy wheeler harwood and ryan (tarp) pierce of signal fire, a non-profit that hosts artist residencies and workshops in the backcountry of public lands. whilst on this trip, i took a day to park myself by the water station (which was a big blue canvassy bag bulging with water gathered from the miraculous canyon creek that we were camping along. [a creek! cutting through a canyon! IN THE DESERT!] this blue bag hung from a branch while the water slowly passed through the filter at the bottom of the bag and then dripped from a tube into a blue 5 gallon plastic jerrycan-ish jug. throughout the day, we would stop off at this station to fill our water bottles. hydrating in the desert was serious business.) i parked there to listen to my fellow desert artists talk about water as they would come to refill their bottles. would you like to tell me a story about water? i would ask, when one of them would tromp down the dirt/dust mini ravine in order to cross the creek trickle in order to reach the water station with their bottle in hand. 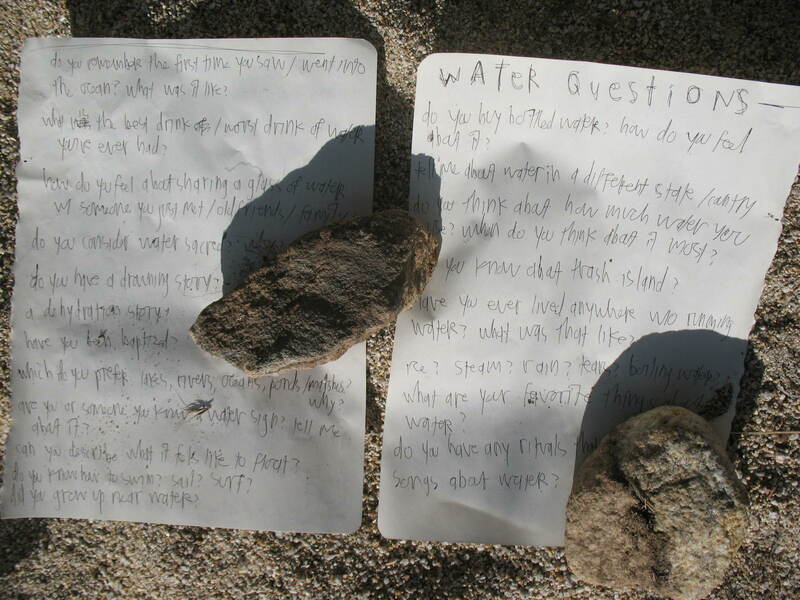 if you don’t know what to say, i wrote some questions out that might help get you thinking i would say and then point to the papers i ripped out of my notebook with water-related questions on them. i fastened the stray papers to the sand with a rock on each. after talking for months about wanting to gather water stories from all around the world, i finally (in a desert only mere hours from where i reside) began asking questions, listening to stories, and collecting details. this realization on top of the experience of asking and listening at the watering hole, moved me from thinking about collaboration (which is the word i have been using for a long while now to say that i am interested in including others in my writing process) to the concept of engaging in writing as social practice. and i’m not even 100% certain yet what the differences between the two are for me (and for my work), but it feels like a move in the right direction. perhaps the difference is here: a collaboration could simply be a project that two friends create together or an invitation at a poetry reading for the audience to participate, but employing writing as social practice could be something that changes public space and therefore reshapes the way people move or interact in that space. perhaps it could even disrupt or intervene. this is not to put more value on either collaboration or social practice, i think they’re both equally fabulous concepts, it’s just a new way of thinking about the work i want poetry to do – the functions i want it to have. this brings me to an interview (which reads less like a conversation, but more like a back-and-forth essay) between poet/activist/scholar philip metres and poet/labor activist mark nowak, all 14 pages of which i found worth reading. in it nowak discussed giving readings or hosting other literary events in non-traditional poetry/literary event spaces (premiering a play [about a bakery truck driver whose husband is killed in a mining accident] at a UAW local 879 Union Hall instead of a theater) and how this shifted the audience from primarily members of the literary community to half and half literary community and plant workers and folks from various unions. 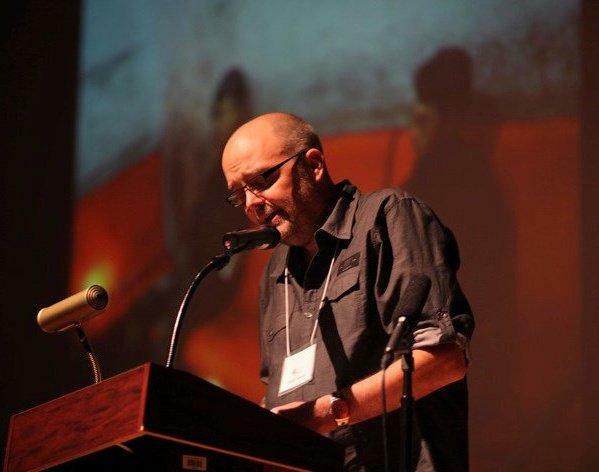 nowak has also brought poetry workshops to non-traditional workshop spaces such as holding workshop between shifts inside a closing ford assembly plant in st. paul minnesota in 2006. a few years after that, he was invited as a visiting professor to the university of minnesota where he was asked to teach a seminar on the poetry dialogues he started up at the ford plant. rather than perform an autopsy on my own recent projects, nowak said, i devised a syllabus in which students… were required to design, facilitate, and document their own ‘poetry dialogues’ at their places of work… one of my favorites, among many, was a student who worked the night shift at UPS who led poetry workshops inside the back of the UPS delivery trucks with his co-workers. this is the paragraph that i wrote THIS IS IT!!! next to in huge letters under a hasty asterisk. 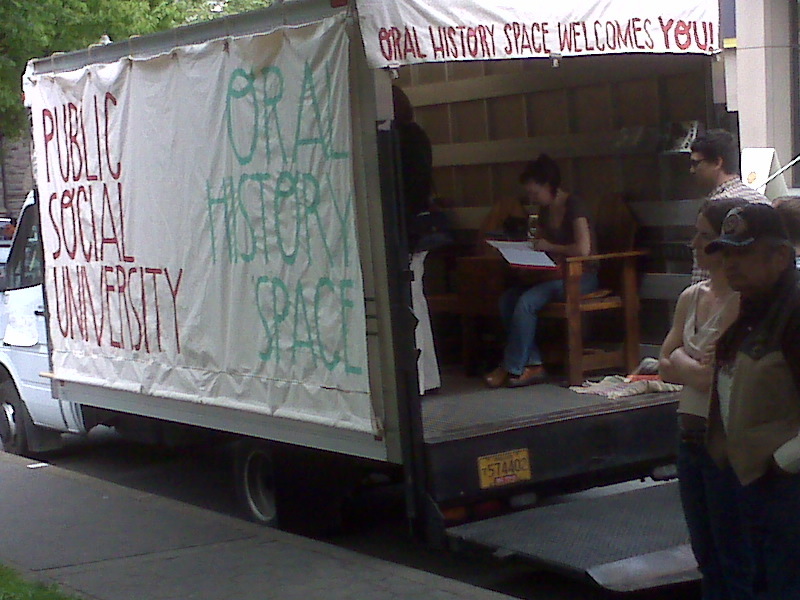 a poetry workshop in the back of a UPS truck!? a poetry workshop after hours in a closing ford plant!? this helps me understand the breadth of possibility behind the concept of poetry/writing as social practice that i was trying to get at earlier… bringing poetry into places it doesn’t normally belong, opening up a dialogue around it with those who are willing. not telling the story of others, but creating the space (in unlikely settings) for the people to write/tell their stories themselves. this. this helps me understand what one version of writing as social practice can look like. this helps me clarify my visions of how poetry can move beyond the (loose) boundaries of the literary community. this gives me an understanding of what i am battling for when i say i believe in poetry that is accessible to the people. A story about water: yesterday, after a lifetime of living on coasts, I saw a whale for the first time. I had hiked out to a preserve north of Santa Cruz to see elephant seals (anti-climatic), and the volunteer naturalist pointed out the spouts of a migrating grey whale and her calf, a couple hundred yards out. It doesn’t look like much, and can be hard to distinguish from the white caps. I guess all these years, I didn’t really now what to look for. This is lovely. Wonderful. Thank you for this.